So are entertainment expenses really not deductible anymore? How about meals? The new tax reform has brought an endless amount of change to tax law, and one of the most interesting parts affecting most (if not all) businesses are the changes to meals and entertainment expense deductions. We all have reaped the benefits of going out to eat and throwing parties and events while being able to deduct the associated costs, but we just might have to start referring to these times as the good ol’ days. Here are four deductions that have changed under the 2018 tax reform. Expenses incurred for entertainment purposes have basically gone out the window starting tax year 2018. Think you can take your most loyal customer out for a round of gold and deduct the costs? Think again. Let’s say you have a year-end mixer with clients and prospective clients. Sorry, that’s a no go. Really, the only entertainment-related expenses that are allowed are parties and other activities that are for and with employees. Specifically, most of the people attending the year-end party, team building outing, or whatever it is, must be employees. When assessing the employee nonemployee ratio, do not include owners, directors, officers, or highly compensated workers on the employee side. Rather, those entities are nonemployees. Meals with clients might be the most popular type of meals and entertainment expense taken. This most likely won’t change in the coming years as you are still allowed to deduct 50% of the costs. However, unlike last year when the requirements were that the taxpayer had to be present and the meal not be lavish or extravagant, the tax reform has brought an additional requirement of business being conducted during the meal. Just make sure to discuss some business and you should be good to go. Remember when we talked about entertainment expenses and how they’re not deductible? Well entertainment-related meals are no different. If the meal has some sort of entertainment experience related to it, you’re out of luck. Just make it a rule of thumb to separately purchase meals while at entertainment events so you can still deduct 50% of the meals. We already know that entertainment expenses are not deductible, but what if it’s for charity? It’s a good idea, if only it was allowed. That’s right, expenses for charitable sport events are not deductible anymore. If that wasn’t bad enough, tickets to a college or other educational institution athletic event are not deductible anymore either. Unsurprisingly, the transportation and parking costs incurred to go to these events aren’t deductible at all. The best way to make sure you don’t deduct anything you shouldn’t is to adjust your chart of accounts to split up meals and entertainment into specific categories. 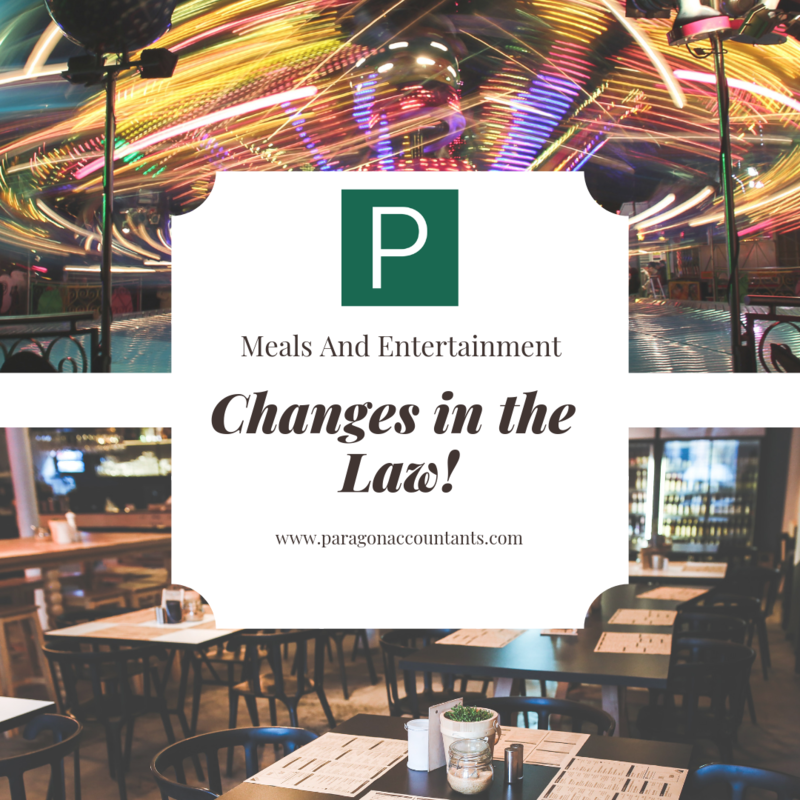 Of course, you also want to become familiar with all other tax law changes regarding meals and entertainment in order to create the right accounts and categorize the expenses correctly. If you ever need assistance with correctly tracking meals and entertainment expenses or overall bookkeeping, look no further than Paragon Accountants! Our one stop shop service can take care of all your bookkeeping, advisory, and tax needs!